Once again I stuck my hand into the section of my LP’s that belonged to my mom and what did I pull out??? The soundtrack to The Wizard of Oz. Just couldn’t do it. 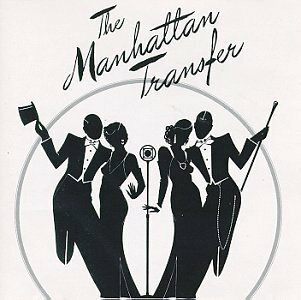 A second dip in nets us The Manhattan Transfer! I remember growing up both of my parents loving them. I have vague memories of listening to them, but can’t say that this album is the one that sticks out in my memory. And I don’t know if it’s because I made excessively strong coffee this morning, but this album is pretty awesome! Some details, this album is the self-titled The Manhattan Transfer which came out in 1975 on Atlantic Records. I’m listening to their first hit, Operator, right now. This is the song that got them recognized. The group has had a few iterations over the years, lineup changes, sound changes, etc. This album reflect the second lineup of The Manhattan Transfer. This group consists of original member Tim Hauser with Alan Paul, Janis Siegel, and Laurel Masse. The sound of this album is poppy, swingy, hints of gospel,crooning and jazz. There are songs I could imagine Rosemary Clooney singing and then “Gloria” which I could see being fully appropriated by the Whiffenpoofs. Just as I’m thinking, egads, I’m not sure my “awesome” statement was correct, “Clap Your Hands” comes on and I’m back in the swing of things. As this is a vocal group there are a lot of harmonies, which I can totally dig. It plays to the strengths of each member, and there isn’t one consistent sound as I mentioned above. It makes for fun listening, I was thinking that it was more like a mix than an album, with the only difference being that this is one group, rather than, well, a mix of groups. That’s how broadly it swings. I’m going to to definitely recommend this album for a listen. It’s good. It’s fun.